When I think of summer I think of rum drinks. And when I think of rum drinks one of the first cocktails that comes to mind is a classic: Mount Gay Tonic. The recipe is easy: a handful of ice cubes, a few ounces of Mount Gay Eclipse rum, tonic water, and a lime. 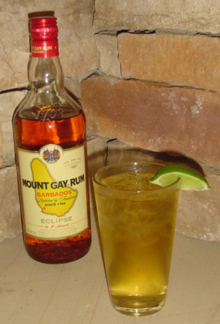 The result is a refreshing drink with the caramel and banana that defines Mount Gay Eclipse, but mixed with tonic so its goes down easy. And if you don’t think that a drink called the Mount Gay Tonic is manly enough, just keep this in mind: The first drink James Bond orders in Casino Royale isn’t a dry martini, shaken not stirred (also known as a weak martini), but a Mount Gay and soda, the twin brother of the Mount Gay Tonic. As for cigars, you’ll want to shy away from anything too powerful, so stick with mild- or medium-bodied smokes that won’t overpower this crisp, spirited drink. A Connecticut-wrapped smoke like the Nub Connecticut or Cuban Crafters Medina 1959 will go perfectly. On the other hand, I also found that a medium-bodied maduro like the Romeo y Julieta Vintage Maduro makes for a nice complement. No matter what cigar you pair with the Mount Gay tonic, it’ll be a perfect pairing for the beach or by the pool on a hot summer afternoon. Right you are about the MGT… It is the perfext summer cocktail!